Kaas, Q. and Lefranc, M.-P. Current Bioinformatics, 2, 21-30 (2007). 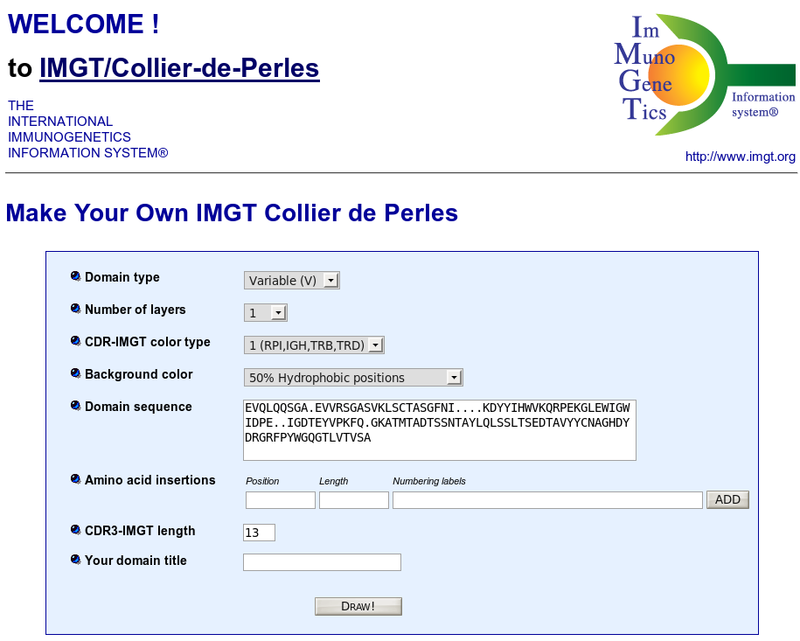 IMGT/Collier-de-Perles is part of IMGT®, the international ImMunoGeneTics information system®, the high-quality integrated information system specialized in immunoglobulins (IG), T cell receptors (TR), major histocompatibility complex (MH) of human and other vertebrates species, immunoglobulin superfamily (IgSF), MHC superfamily (MhcSF) and related proteins of the immune system (RPI), created in 1989 by Marie-Paule Lefranc (Laboratoire d'ImmunoGénétique Moléculaire, LIGM, Université Montpellier II and CNRS) and on the Web since July 1995. 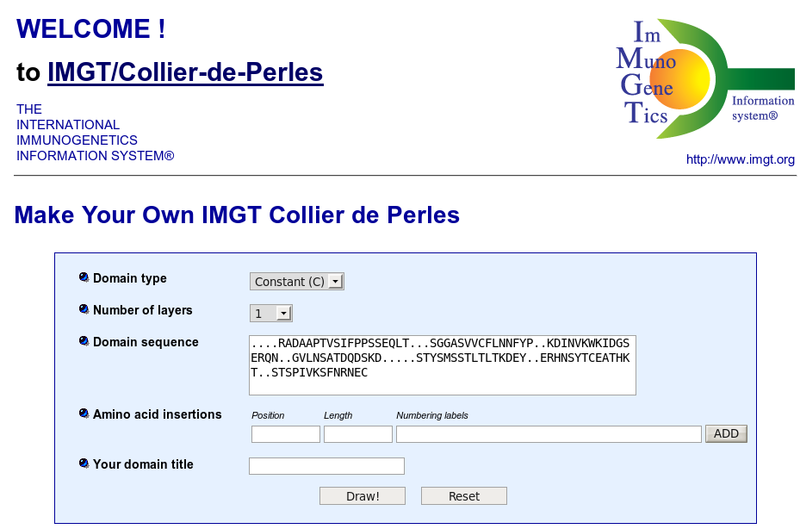 IMGT/Collier-de-Perles is a tool that allows to draw standardized IMGT 2D graphical representations of protein domains, or IMGT Colliers de Perles, starting from the user own domain amino acid sequences. 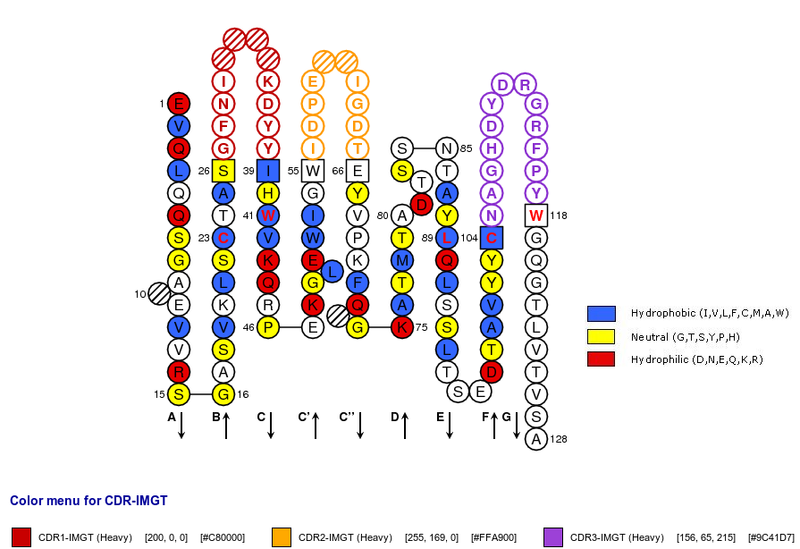 IMGT Colliers de Perles can be drawn for four domain types: variable (V) domain, constant (C) domain and scavenger (S) domain of the immunoglobulin (IG) and T cell receptor (TR) and other members of the immunoglobulin superfamily (IgSF), and groove (G) domain of the major histocompatibility complex (MH) and other members of the MHC superfamily (MhcSF). Sequences have to be gapped according to the IMGT unique numbering using for example, IMGT/DomainGapAlign. Resulting IMGT Colliers de Perles allow to quickly visualize amino acids which are important for the 3D structural configuration, and to delimit the standardized framework regions (FR-IMGT) and complementarity determining regions (CDR-IMGT) of the IG and TR V-DOMAIN. 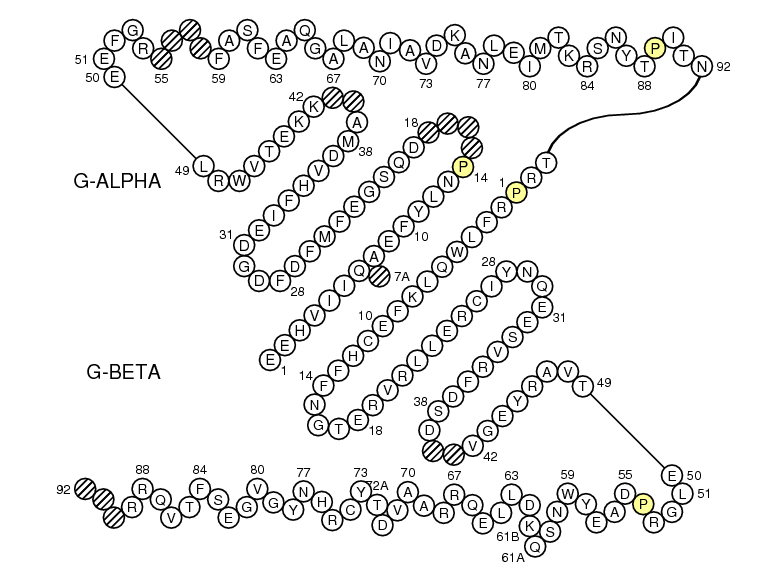 The length of the strands, loops and turns and, for the G type, the length of the helix represented in IMGT Colliers de Perles become crucial information in the domain characterization. By default, the web application is loaded for V type domains. Locate the "Domain type" drop-down list: "Variable (V)" is displayed. "Variable (V)" allows to draw IMGT Colliers de Perles for variable domains which include the V-DOMAIN of IG and TR and the V-LIKE-DOMAIN of IgSF other than IG and TR. Locate the "Number of layers" drop-down list. Select 1 or 2, depending on the number of layers you want for the display of the IMGT Collier de Perles. Default is 1. This choice is only available for variable (V) and constant (C) domains. Locate the "CDR-IMGT color type" drop-down list, and select "1 (RPI,IGH,TRB,TRD)" or "2 (IGK,IGL,TRA,TRG)" depending on the locus to which the sequence belongs. This choice is only available for variable (V) domains. 50% Hydrophobic positions: positions that have an hydrophobic amino acid (hydropathy index with positive value) or a tryptophan (W) like 50% or more of analysed V domains (blue positions in IMGT Collier de Perles). IGH 80% hydropathy classes: positions with amino acids (AA) that have the same hydropathy class, like 80% or more of analysed IGH V domains (3 classes). IGK 80% hydropathy classes: positions with AA that have the same hydropathy class, like 80% or more of analysed IGK V domains (3 classes). IGL 80% hydropathy classes: positions with AA that have the same hydropathy class, like 80% or more of analysed IGL V domains (3 classes). IGH 80% volume classes: positions with AA that have the same volume class, like 80% or more of analysed IGH V domains (5 classes). IGK 80% volume classes: positions with AA that have the same volume class, like 80% or more of analysed IGK V domains (5 classes). IGL 80% volume classes: positions with AA that have the same volume class, like 80% or more of analysed IGL V domains (5 classes). IGH 80% physicochemical classes: positions with AA that have the same physicochemical class, like 80% or more of analysed IGH V domains (11 classes). IGK 80% physicochemical classes: positions with AA that have the same physicochemical class, like 80% or more of analysed IGK V domains (11 classes). IGL 80% physicochemical classes: positions with AA that have the same physicochemical class, like 80% or more of analysed IGL V domains (11 classes). Locate the "Amino acid insertions" text area, and enter, if needed, amino acids insertions. This option is only needed if you deal with unusual sequences characterized by insertions compared to the reference sequences. This can be the case of IgSF V-LIKE-DOMAIN that have amino acid insertions compared to the IG and TR V-DOMAIN. The program for renumbering is based on an alignment of Smith and Waterman, that use IMGT insertions as new amino acids and strongly penalize the opening of gaps in the reference sequence. To add an insertion, enter the position that precedes the insertion, the length (that is the number of amino acids to add) and the numbering label(s) of the novel positions, for instance "84,1,84A" means that, following 84, one insertion labelled 84A has to be added. Then click "ADD". Repeat the process if several insertions have to be entered. Locate the "CDR3-IMGT length" text area, and enter the length of the CDR3-IMGT (required). Locate the "Your domain title" text area, and enter a name that you would like to be displayed in the figure (optional). Press the "Draw !" button to visualize the IMGT Collier de Perles for V domain. This will return a page showing the IMGT Collier de Perles taking into account your choices. 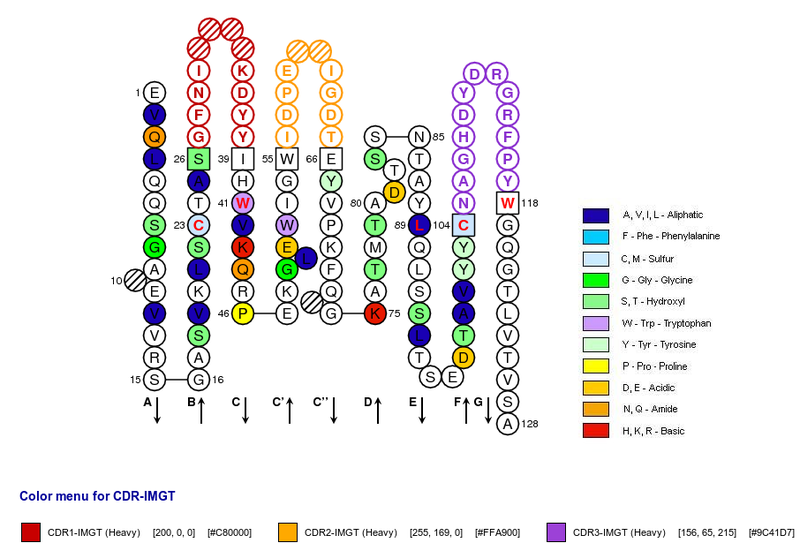 IMGT Collier de Perles of a variable (V) domain, on one layer, obtained after selection of "1 (RPI,IGH,TRB,TRD)" in CDR-IMGT color type, the domain belonging to an IGH chain, by default "50% Hydrophobic positions" and a CDR3-IMGT length of 13. Positions in blue mean that the AA of the user sequence at these positions is hydrophobic (hydropathy index with positive value) or is a tryptophan (W), like in 50% or more of analysed V domains. 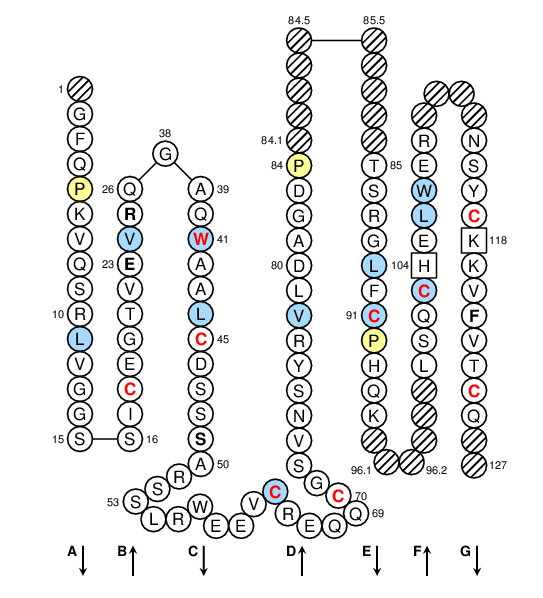 Positions with red and bold letters indicate the five conserved positions of a V domain: 1st-CYS 23, CONSERVED-TRP 41, hydrophobic 89, 2nd-CYS 104 and J-TRP 118. Anchor positions are in square. Hatched positions correspond to gaps according to the IMGT unique numbering for V domain. Proline are shown in yellow. Arrows indicate the beta strands and their direction. The CDR-IMGT lengths of this domain are [10.7.13]. IMGT Collier de Perles of a variable (V) domain with "IGH 80% hydropathy positions". Colored positions (3 classes) mean that the property of the AA of the user sequence at these positions is found in more than 80% of the analysed IGH V domains. IMGT Collier de Perles of a variable (V) domain with "IGH 80% hydropathy positions". Colored positions (3 classes) mean that the property of the AA of the user sequence at these positions is found in more than 80% of the analysed IGH V domains. IMGT Collier de Perles of a variable (V) domain with "IGH 80% volume positions". 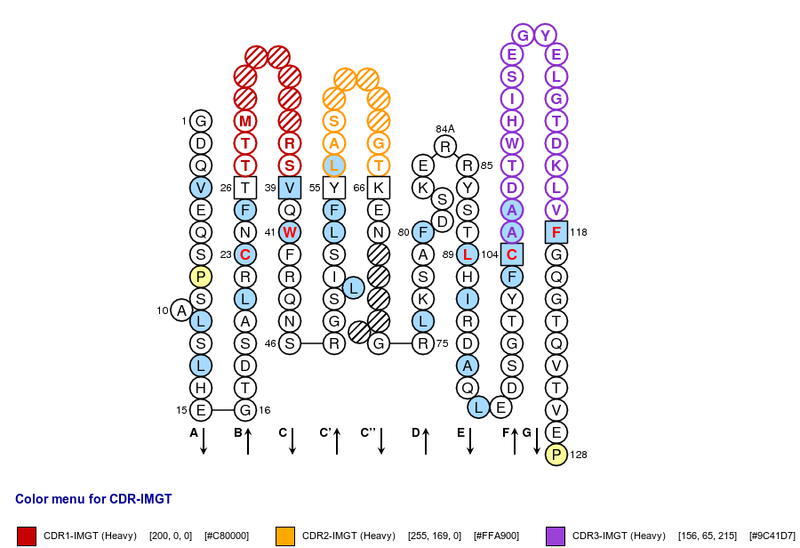 Colored positions (5 classes) mean that the property of the AA of the user sequence at these positions is found in more than 80% of the analysed IGH V domains. IMGT Collier de Perles of a variable (V) domain with "IGH 80% physicochemical positions". Colored positions (11 positions) mean that the property of the AA of the user sequence at these positions is found in more than 80% of the analysed IGH V domains. IMGT Collier de Perles of a variable (V) domain, on two layers, obtained after selection of "2" in Number of layers, "1 (RPI,IGH,TRB,TRD)" in CDR-IMGT color type, the domain belonging to an IGH chain, and by default "50% Hydrophobic positions". Locate the "Domain type" drop-down list and choose "Constant (C)". This will change the page of the web application. "Constant (C)" allows to draw IMGT Colliers de Perles for constant domains which include the C-DOMAIN of IG and TR and the C-LIKE-DOMAIN of IgSF other than IG and TR. Locate the "Amino acid insertions" text area, and enter, if needed, amino acids insertions. This option is only needed if you deal with unusual sequences characterized by insertions compared to the reference sequences. This can be the case of IgSF C-LIKE-DOMAIN that have amino acid insertions compared to the IG and TR C-DOMAIN. The program for renumbering is based on an alignment of Smith and Waterman, that use IMGT insertions as new amino acids and strongly penalize the opening of gaps in the reference sequence. To add an insertion, enter the position that precedes the insertion, the length (that is the number of amino acids to add) and the numbering label(s) of the novel positions, for instance "84,1,84A" means that, following 84, one insertion labelled 84A has to be added. Then click "ADD". Repeat the process if several insertions have to be entered. Press the "Draw !" button to visualize the IMGT Collier de Perles for C domain. This will return a page showing the IMGT Collier de Perles taking into account your choices. IMGT Collier de Perles of a constant (C) domain, on one layer, the domain belonging to an IGH chain. 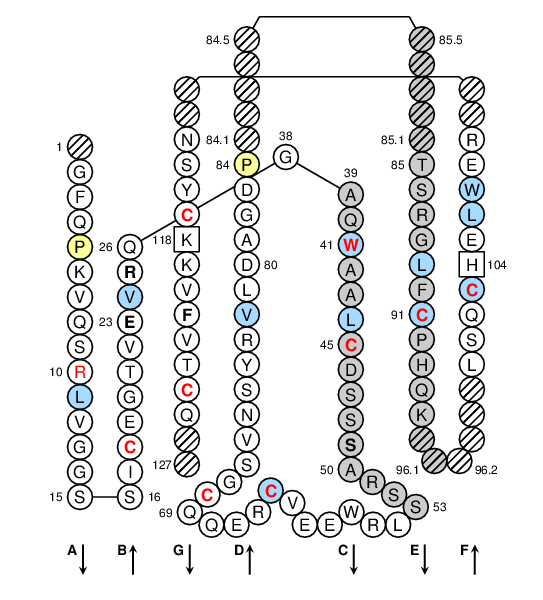 Positions in blue mean that the AA of the user sequence at these positions is hydrophobic (hydropathy index with positive value) or is a tryptophan (W), like in 50% or more of analysed V domains. 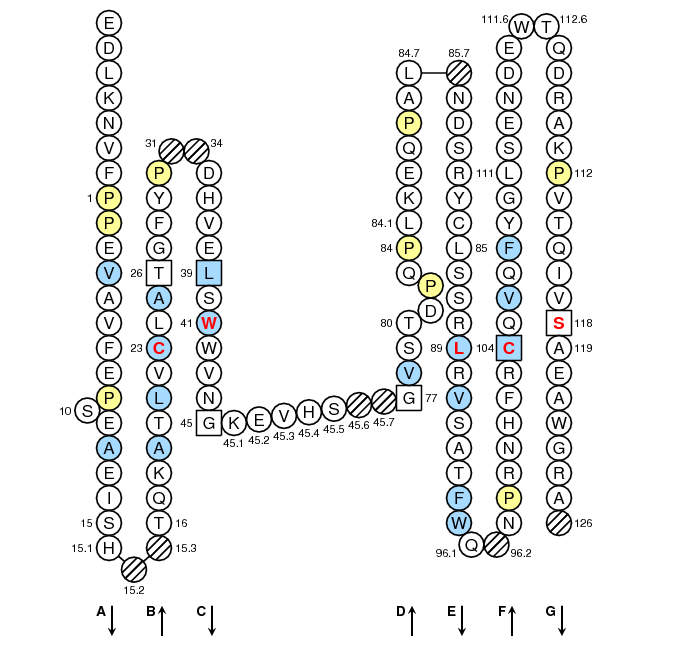 Positions with red and bold letters indicate the five conserved positions of a V domain: 1st-CYS 23, CONSERVED-TRP 41, hydrophobic 89 and 2nd-CYS 104. Anchor positions are in square. Hatched positions correspond to gaps according to the IMGT unique numbering for C domain. Proline are shown in yellow. 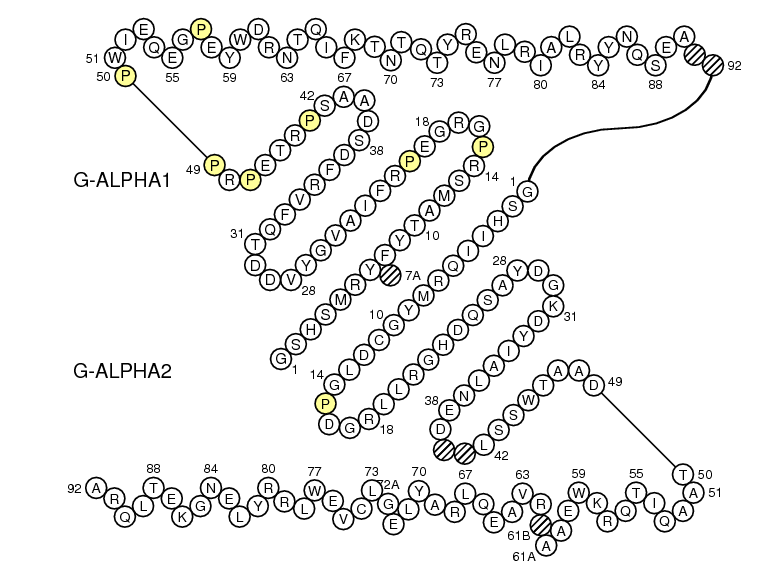 Arrows indicate the beta strands and their direction. IMGT Collier de Perles of a constant (C) domain, on two layers, obtained after selection of "2" in Number of layers, the domain belonging to an IGH chain. Locate the "Domain type" drop-down list and choose "Groove (G)". This will change the page of the web application. "Groove (G)" allows to draw IMGT Colliers de Perles for groove domains which include the G-DOMAIN of MH and the G-LIKE-DOMAIN of MhcSF other than MH. As a groove is made of 2 G domains, the sequences of the two domains for the IMGT Colliers de Perles are entered in the same page. Locate the "Link G-DOMAINs" checkbox. 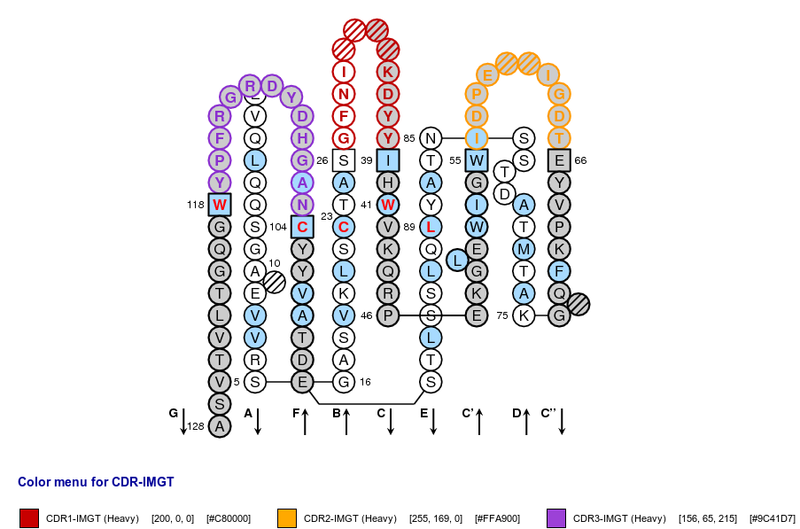 Check it if your sequences are domains of MH1 or RPI-MH1Like, to have them linked. Locate the "Amino acid insertions" text area, and enter, if needed, amino acids insertions. This option is only needed if you deal with unusual sequences characterized by insertions compared to the reference sequences. 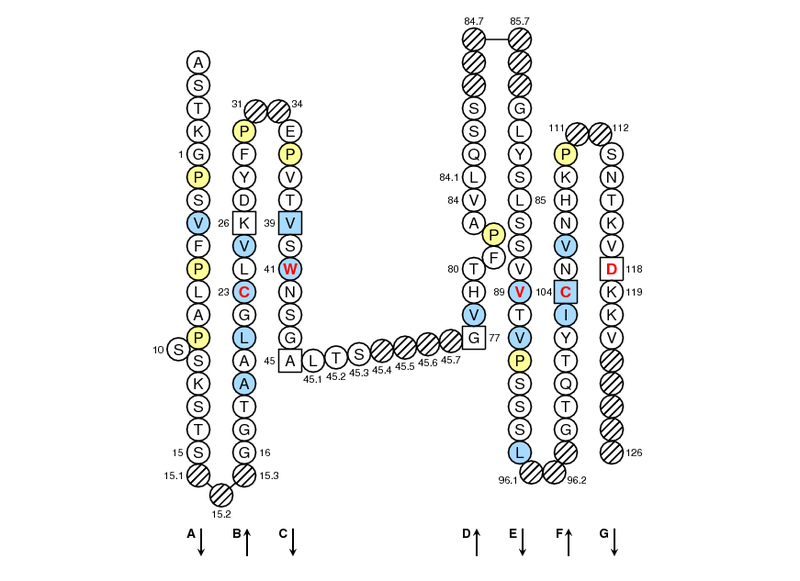 This can be the case of MhcSF G-LIKE-DOMAIN that have amino acid insertions compared to the MHC G-DOMAIN. The program for renumbering is based on an alignment of Smith and Waterman, that use IMGT insertions as new amino acids and strongly penalize the opening of gaps in the reference sequence. To add an insertion, enter the position that precedes the insertion, the length (that is the number of amino acids to add) and the numbering label(s) of the novel positions, for instance "72,1,72A" means that, following 72, one insertion labelled 72A has to be added. Then click "ADD". Repeat the process if several insertions have to be entered. Locate the "Amino acid insertions" text area, and enter, if needed, amino acids insertions. Press the "Draw !" 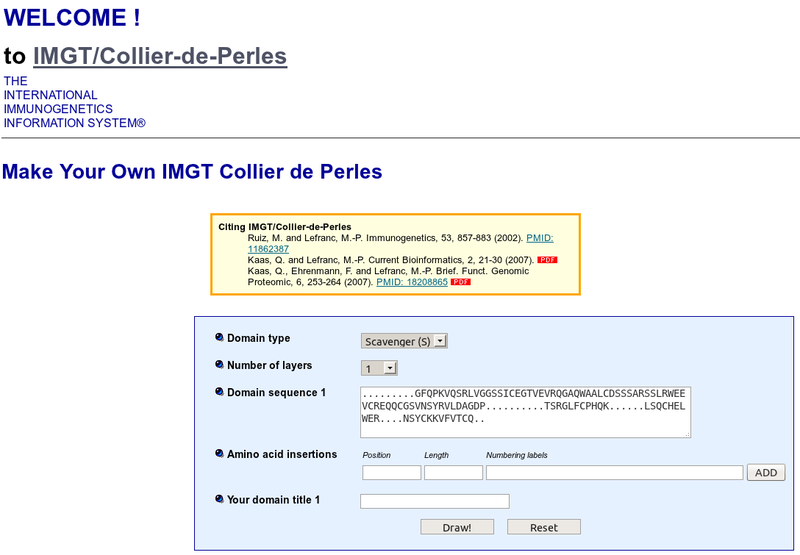 button to visualize the IMGT Collier de Perles for G domain. This will return a page showing the IMGT Collier de Perles taking into account your choices. IMGT Colliers de Perles of groove (G) domains of MH1 (the domains are linked as selected by the user). IMGT Colliers de Perles of groove (G) domains of MH2 (the domains are linked as selected by the user). Locate the "Domain type" drop-down list and choose "Scavenger (S)". This will change the page of the web application. "Scavenger (S)" allows to draw IMGT Colliers de Perles for scavneger domains which include the S-DOMAIN of IgSF other than IG and TR. Locate the "Number of layers" drop-down list. Select 1 or 2, depending on the number of layers you want for the display of the IMGT Collier de Perles. Default is 1. This choice is only available for variable (V), constant (C) and scavenger (S) domains. Locate the "Domain sequence" text area, and enter your gaped sequence obtained, for example, from IMGT/DomainGapAlign. This option is only needed if you deal with unusual sequences characterized by insertions compared to the reference sequences. This can be the case of IgSF C-LIKE-DOMAIN that have amino acid insertions compared to the IG and TR C-DOMAIN. The program for renumbering is based on an alignment of Smith and Waterman, that use IMGT insertions as new amino acids and strongly penalize the opening of gaps in the reference sequence. To add an insertion, enter the position that precedes the insertion, the length (that is the number of amino acids to add) and the numbering label(s) of the novel positions, for instance "84,1,84A" means that, following 84, one insertion labelled 84A has to be added. Then click "ADD". Repeat the process if several insertions have to be entered. Press the "Draw !" button to visualize the IMGT Collier de Perles for S domain. This will return a page showing the IMGT Collier de Perles taking into account your choices. IMGT Collier de Perles of a scavenger (S) domain, on one layer. 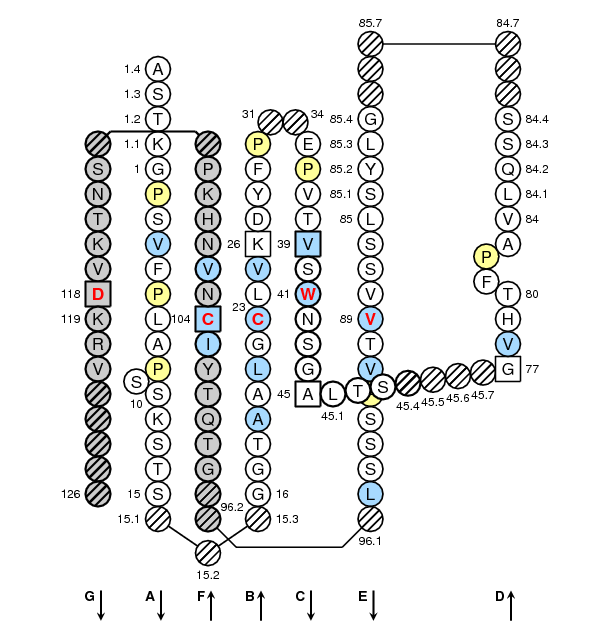 Positions in blue mean that the AA of the user sequence at these positions is hydrophobic (hydropathy index with positive value) or is a tryptophan (W), like in 50% or more of analysed S domains. 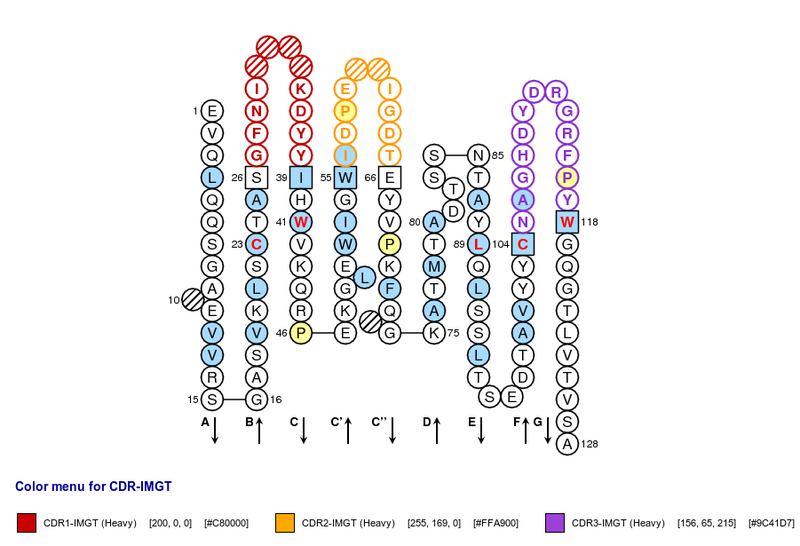 Positions with red and bold letters indicate the five conserved positions of a S domain: CYS 18, CONSERVED-TRP 41, CYS 45, CYS 60, CYS 70, hydrophobic 89, CYS 91, CYS 103, CYS 117 and CYS 124. Hatched positions correspond to gaps according to the IMGT unique numbering for S domain. Proline are shown in yellow. Arrows indicate the beta strands and their direction. IMGT Collier de Perles of a scavenger (S) domain, on two layers, obtained after selection of "2" in Number of layers. 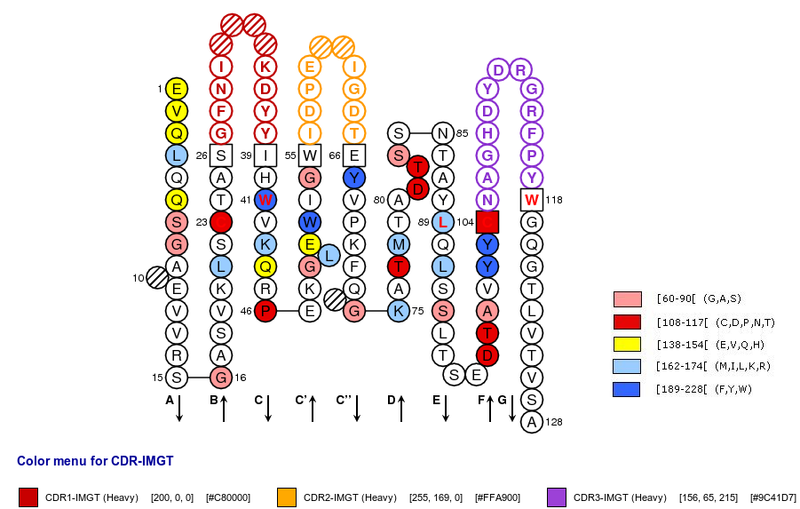 Software material and data coming from IMGT server may be used for academic research only, provided that it is referred to IMGT®, and cited as "IMGT®, the international ImMunoGeneTics information system® http://www.imgt.org (founder and director: Marie-Paule Lefranc, Montpellier, France)." References to cite: Lefranc, M.-P. et al., Nucleic Acids Res., 27:209-212 (1999); doi: 10.1093/nar/27.1.209; Cover; Ruiz, M. et al., Nucleic Acids Res., 28:219-221 (2000); doi: 10.1093/nar/28.1.219; Lefranc, M.-P., Nucleic Acids Res., 29:207-209 (2001); doi: 10.1093/nar/29.1.207; Lefranc, M.-P., Nucleic Acids Res., 31:307-310 (2003); doi: 10.1093/nar/gkg085; Lefranc, M.-P. et al., In Silico Biol., 5, 0006 (2004) [Epub], 5:45-60 (2005); Lefranc, M.-P. et al., Nucleic Acids Res., 33:D593-597 (2005); doi: 10.1093/nar/gki065; Lefranc, M.-P. et al., Nucleic Acids Res., 37:D1006-1012 (2009); doi: 10.1093/nar/gkn838; Lefranc, M.-P. et al., Nucleic Acids Res., 43:D413-422 (2015); doi: 10.1093/nar/gku1056.